Around 2009 a friend introduced me to a new part of Dubai, this part of the city has been a source of discovery and inspiration ever since. I frequent the Mina Bazar regularly, and I would even say; this place has contributed to my growth as a photographer. My friend has left Dubai, but I would think of her gift to me every time I went over and walked around this part of Dubai. 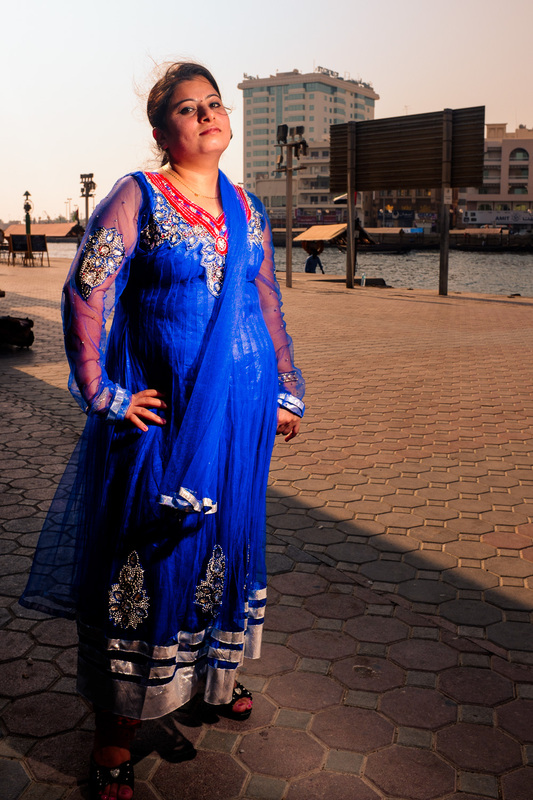 After so many years my friend Ashifa visited Dubai and we had a chance to explore the Mina Bazar together again, walking around the textile market then crossing the Dubai Creek on the traditional Abra over to the Spice Souq on Deira side of Dubai and then back to Bur Dubai side again. As the Friday afternoon sun started cooling down, the area next to the creek started getting more active with weekend visitors of the market and the surrounding cafe’s and gardens. As I we walked between people through the brutal August humidity occasionally feeling a refreshing breeze the one thing that kept on catching my attention was the ladies in their colourful Saris and Shalwar kameez gracefully standing with their friends and socialising or walking around with their partners or spouse. Adding an amazing touch of colour and grace to the creek side, at the close of another day of discovery of my favourite part of Dubai. Beautiful women, beautiful saris, beautiful pictures! Thanks, Issa!